British citizens who are knighted have “Sir” added to their name, as in Sir Richard Branson, but foreigners don’t. Mr. Bloomberg can add KBE, which stands for Knight Commander of the British Empire, to the end of his name. 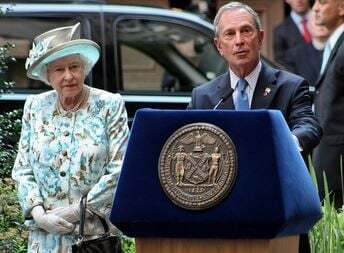 Mr. Bloomberg with The Queen in 2010. The honorary award was announced by Sir Peter Westmacott, the British ambassador to the United States, who said that Mr. Bloomberg was pivotal in forging economic, cultural, and diplomatic transatlantic ties. Sir Peter said Mr. Bloomberg had made a considerable contribution to British business life through Bloomberg “(his) considerable philanthropic endeavors in the arts and education is felt by Britons every day,” he added. According to the British Embassy in Washington, Mr. Bloomberg has donated £42.4 million to various charitable causes in the United Kingdom. His close partnership with Boris Johnson, the Mayor of London, “is illustrative of the strong relationship between the US and UK,” it wrote. Michael Rubens Bloomberg KBE was born in 1942 in Boston, US. He is a politician, philanthropist and business magnate. He was the 108th Mayor of New York City and held office for three successive terms, winning elections in 2001, 2005 and 2009. Mr. Bloomberg has a net worth of $34 billion, making him the 16th richest person in the world and the 11th richest in the US. He founded the global financial data and media company Bloomberg L.P., (88% owner). The company’s Bloomberg Terminal is used by financial professionals across the globe.